The University of California, Irvine (UCI) kicked off its Moonshot Initiative earlier this week, taking another step toward becoming the first college to send a liquid-fueled rocket into space. The university received a $1 million gift from Base 11, a nonprofit STEM workforce development and entrepreneur accelerator, to fund the initiative. 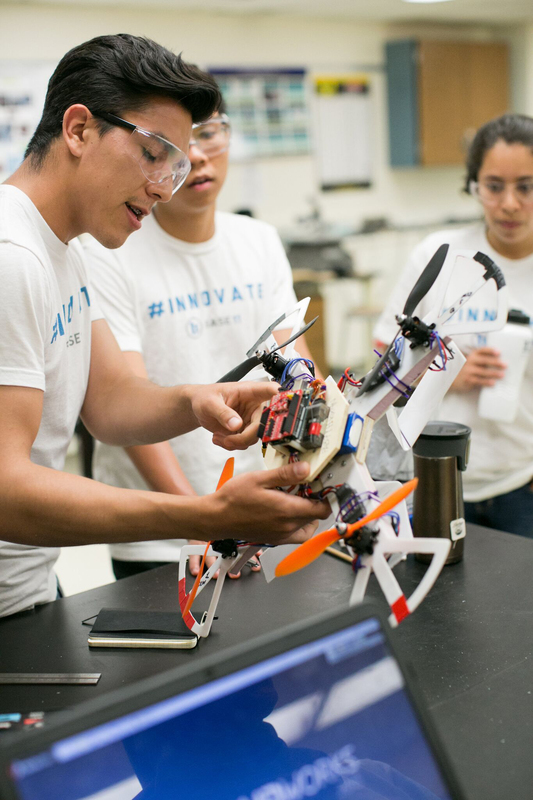 Community college students (pictured) last summer spent eight weeks at UCI's engineering school learning to design and build drones. Last summer, five community college students from across the country spent two months building an unmanned aircraft system, or drone, and then testing it for flight at UCI, as part of the UCI Base 11 Autonomous Systems Engineering Academy, according to a UCI statement. The Moonshot Initiative is the latest effort from the partners. The rocket “will be built from a prefab prototype that UCI students will modify to travel 25,000 feet high and then further refine to reach 50,000 feet. The ultimate goal is to construct a rocket within two years that breaches outer space, surpassing the Karman line at about 328,000 feet,” the statement said. Additionally, Base 11 has funded a year-round academic-year internship program for low-resource community college students from around Southern California to attend UCI on the weekend. Participating students will gain exposure to university-level engineering concepts. As part of the partnership, the Henry Samueli School of Engineering will lead a pilot of Base 11’s STEM Entrepreneurship Program that will involve the Institute for Design & Manufacturing Innovation. To learn more, visit the Base 11 site.